The search has been in vain. Arnold Palmer always had a canny eye on the future, an instinct for what lay ahead that triggered a multitude of successful endeavors. It goes way back. Soon after Palmer’s first Masters win in 1958 he shook hands on a partnership with business manager Mark McCormack that lasted the rest of their lives. McCormack, himself a visionary, was working with a number of leading players but Palmer persuaded McCormack to represent only him, even though the golfer knew he could not expect their exclusive arrangement to last indefinitely. As it happened the exclusivity did not last long—probably less time than Palmer had expected—because no sooner had he reached the top of the game than Gary Player and Jack Nicklaus emerged as his closest, fiercest rivals. But there was also a strong affinity between the three men, and Palmer cleared the way for both Player and Nicklaus to work with McCormack at the turn of the 1960s. Never an isolationist, Palmer could sense the greater good in helping his rivals prosper, but not even he could have predicted what would unfold over subsequent decades as the exploits of a trio who would become known as “The Big Three” would become golf’s greatest epic, one that would shape the modern game. Really, this was what the swingin’ sixties were all about. Player was first to challenge Palmer among the pro ranks. The little-known 22-year-old South African oddly won the 1958 Kentucky Derby Open with a funny, flat golf swing and certain lack of length off the tee. “Just an anomaly,” people said. Then, two months after Palmer had won his first Masters, Player raised eyebrows among the American elite again when he finished runner-up to Tommy Bolt in the U.S. Open at Southern Hills. A year later he lifted the Claret Jug at the [British] Open for the first time, and when Palmer contrived to lose the 1961 Masters with a shabby, haphazard double bogey at the very last hole, the diminutive Player gratefully slipped his arms into the Green Jacket. He found it to be a great fit. “No player I can think of made more of his gifts than Gary,” Palmer would later write in his book A Golfer’s Life. “I think there was something to Billy Maxwell’s remark that among The Big Three, Gary was perhaps the greatest competitor—simply because if he hadn’t been, he wouldn’t have been among The Big Three. Relatively short off the tee, he made himself one of the premier sand players and clutch putters of all time. By contrast, the arrival of Nicklaus was forewarned. He was a Walker Cup golfer and Ohio State star who won the U.S. Amateur title twice, in 1959 and 1961, and in-between in 1960 made his intentions clear by finishing runner-up to Palmer at the U.S. Open at Cherry Hills. It was the highest finish by an amateur in the U.S. Open in 30 years, since Bobby Jones had won the title for the fourth and final time in 1930. The parallels between Nicklaus and Jones continued, as the “Golden Bear” was the youngest U.S. Open champ—at 22—since Jones in 1923, and he was also the first player since Jones in 1930 to hold the U.S. Amateur and U.S. Open titles simultaneously. They weren’t yet known as “The Big Three,” but that spring and summer of 1962 was when this trinity was formed, and when—for one year and one year only—they won all four of the year’s majors between them. 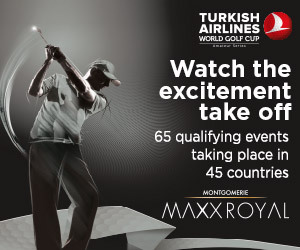 Each one of the four was a collector’s item, and with live television coverage of golf evolving fast the sport’s viewing numbers were growing exponentially. In 1962 Palmer, aged 32 at the time, was in his captivating prime and he set the tone at Augusta National in April, winning his third Green Jacket. He kept Arnie’s Army in suspense though, eventually defeating Player and Dow Finsterwald in the first three-man playoff in Masters history—and banishing the ghost of Palmer’s 1961 Masters collapse in the process. Nicklaus defeated Palmer in the U.S. Open in June; Palmer then successfully defended his [British] Open title at Royal Troon in July, playing some of the finest golf of his career to win by six before Player won the PGA Championship at Aronimink Golf Club in Pennsylvania the very next week, with a late charge from Nicklaus seeing him finish in a tie for third. As usual with Palmer, he could not have put it any better. If it hadn’t stuck already, the moniker of “The Big Three” was tattooed on that American sports psyche by a stroke of McCormack genius, when he negotiated an eight-part TV series called Big Three Golf, which was broadcast nationwide in the U.S. by NBC in 1964. There were other high-ratings TV matches and golfing series, but Big Three Golf was the perfect fit. The three golfers played each other at a series of spectacular courses including Los Angeles Country Club, Firestone, St Andrews and Carnoustie in Scotland, and onto Dorado Beach in Puerto Rico, and the ratings soared. Born in 1929, Palmer was the elder statesman and crowd favorite of The Big Three—six years Player’s senior and a decade older than Nicklaus—and his success in the majors would expire first, on becoming the first golfer to win the Masters four times, in 1964. The tenacious Player would soon after become only the third golfer to complete the career Grand Slam of winning all four major titles—after Gene Sarazen and Ben Hogan—by winning the 1965 U.S. Open, while Nicklaus rapidly followed suit, completing the Grand Slam in the space of just five years with victory in the 1966 [British] Open at Muirfield. Palmer won a total of seven major titles between 1958 and 1964, Player matched Hogan’s career haul of nine majors—Player’s nine secured between 1959 and 1978—while Nicklaus collected a total of 18 from 1962 to the 1986 Masters (aged 46), completing the Grand Slam three full times in the process. Today, with Tiger Woods next in line with 14 career majors—and possibly stuck there—the Golden Bear’s record gleams seductively on a high shelf of its own, still unreachable. When Nicklaus won the 1965 Masters by nine shots—with Palmer and Player in a tie for second place—it prompted Masters co-founder Jones to declare: “Jack plays a game with which I’m not familiar.” Incidentally, this was also the only occasion on which this trio occupied the top three positions on a major’s final leaderboard. Augusta National, which celebrates its past champions with such pride, ultimately initiated a poignant annual reunion of The Big Three by inviting them to serve as honorary starters of the Masters. Having competed in the Masters 50 years consecutively, from 1955 to 2004, it was at Augusta where Palmer really reached stardom and so it could not have been more appropriate when he became the first of the three to strike the honorary tee shot, in 2007. Nicklaus, who played in the Masters 45 times from 1959 to 2005 and won the Green Jacket a record six times, joined Palmer for the tournament’s Thursday breakfast ball from 2010. 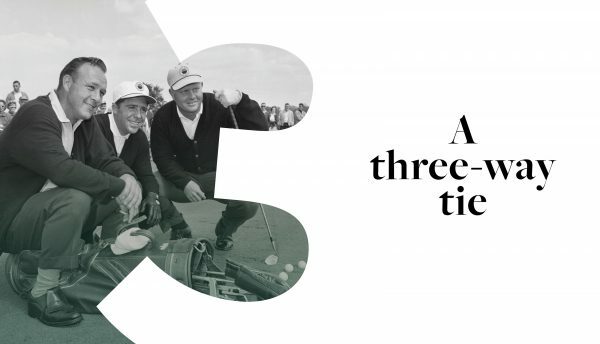 Then the irrepressible Player, three times the Masters champ from 52 appearances between 1957 and 2009, completed the honorary three-ball for the first time in 2012. It is little wonder the first tee on the Thursday morning of the Masters has attracted packed crowds. As ever, the Big Three proved to be the best draw in the game.